This week’s veggie box features the flavorful, last-of-the-season Fairtime peaches. This variety is a yellow-fleshed peach that is freestone meaning the flesh easily separates from the pit making it great for freezing, canning, and cobblers. The melon in your veggie box will be either a cantaloupe or an orange honeydew. September melons, along with tomatoes and peppers, tend to have the highest sugar content. There is only about a month left for purchasing canning tomatoes and pickling cucumbers. Get them while you can! We have completed the winter squash harvest. There are bins full of squash in storage waiting to go into the veggie boxes to stock your pantries during the winter months. 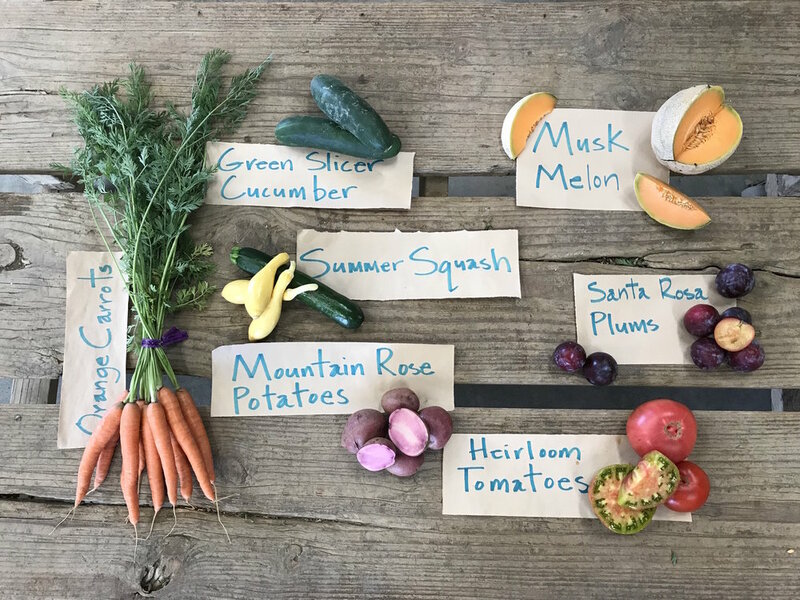 The pepper and tomato harvests are winding down so we will continue to include these summer favorites in the veggie boxes until the first frost ends their production sometime in November. We are beginning to harvest the first of the fall crops including the fast growing Tokyo and Scarlet Queen Turnips. The turnips are delicious raw, eaten like an apple. They are also great braised, roasted, or added as a soup ingredient. The greens are wonderful too: steamed, sautéed, or braised with a dash of salt, olive oil and lemon juice or vinegar. Lettuce will be ready soon too. We had a great time sampling tomatoes at the annual Yolo Land Trust event on Sunday September 11th. Over 400 people attended to taste the delicious food and farm produce samples prepared by chefs from the Sacramento/Davis and Bay Area regions. This annual event raises funds to preserve agricultural land with conservation easements in Yolo County. Thank you Yolo Land Trust for bringing together farmers, wineries, eaters and chefs under the canopy of a walnut orchard to celebrate the rich agricultural bounty of this region! The greenhouses are full of fall and winter transplants: fennel, lettuce, kale, chard, broccoli, and cabbage. Some of the starts have already been transplanted; later plantings will soon go into the ground. We also recently planted garlic cloves for the spring and summer garlic crop. Fall potato plants are about 6 inches tall and will be harvested in late November. We do two potato plantings each year, one in March and one in August.